Interview on waking dreams and a host of other topics. Last week, one of my Youtube channel subscribers asked for some clarification on “Waking Dreams”, so via email, we set up a Facebook Audio/Visual chat session and launched into what I thought was just a private chat. Well, it turns out he recorded our meeting and asked me afterwards if he could publish it as an interview: surprized, I agreed nonetheless. The next day he sent me his processed video of my interview, but as it turns out he has a very slow Web cam and it resulted in a very distracting series of images of me bobbing about in my normal fashion while I speak. Also, not knowing it was an interview, my replies were not as deeply informational as I would have liked for each subject. The subject: that was another surprize, as he started asking me questions about many different subjects which also lends a lighter approach in a discussion. With the state of the original video being what it was, I decided to extract the audio and make my own video of the interview. I took some screenshots from the original and scattered them throughout the video you can see below. Now listening to the original extracted audio, I decided to speed up the tempo, plus I removed all my “Ah’s” and some echo noises as well. All of the main discussion is included in the final product. So what you will hear is a very fast-paced audio which I find quite fascinating, myself and may use in future videos. 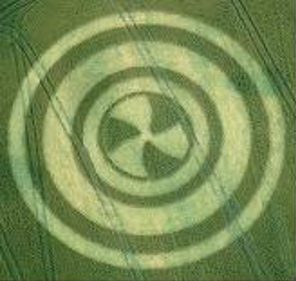 The image below is the Woodbridge 2004 Crop circle (not “Woodburn” as I referred to during the interview). This crop circle is a confirmation that the Sun is safe for Earth and humans and it’s nuclear energy is safely contained, thus exposing all the disinformation about the Sun. Now we aren’t talking about EMP’s here, which are a danger for electronics during and just before the Pole-Shift from Planet X. Neither are we talking about solar flares and CME’s which are a danger to astronauts and satellites. However just after the Pole-Shift, it’s advised to stay out of the Sun for about a month until the atmosphere normalizes somewhat to protect us from the Sun’s rays. Remember, Earth loses a large portion of it’s atmosphere during the Pole-Shift, this is the reason for the caution. This entry was posted in Crop circle analysis, General, Interviews, UFOs and Extraterrestrials and tagged AfterTime, aliens, chris thomas, crop circles, ETs, UFOs, Zetatalk. Bookmark the permalink. 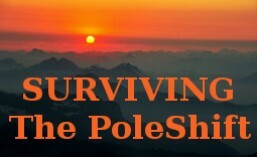 ← The Pole-Shift: Divine assistance is waiting. But did ZT not say it would rain for months after the pole-shift? Or will this incessant rain only occur in certain parts of the world.? For instance under Safe Locations– nothing is mentioned about the copious rain or for how long or how much sun is projected for South Africa? Only that the climate would improve and SA’s general prospects are good. But the rural people are hugely sceptical about aliens– its simply too far removed for what most can accept as credible– at this point anyway. So, although ZT states that SA will fair well during and after the PS– it would be great to just get a clearer and more concise information to share with these good peoples around me. At this point they are determined to immediately start planting maize and other vegetable crops after the PS and don’t believe that river/streams etc and the soil, will remain poisoned and unfit for human consumption for sometime after the pole-shift. I know how busy and increasingly under pressure you are– but also know that the moment the rural people see an overview of South Africa on your site– they would take it seriously and begin preparations. Very practical people, they ask me many questions, which are beyond my scope to answer.– hence I asked above, about how much sunshine or just months of rain? If we don’t have sun, will it be very dark, or will we have enough light to grow plants which are very dependent on light and will it be very cold?- they have grave concerns about cold. Can they build an underground room, in which to store fresh water, canned and dry foods in h/duty jerry cans, plastic buckets/food bins and all their other prep stuff, along with fruit trees they already now want to plant in pots? Would such an underground storage room, built with reinforced concrete, survive the 9 magnitude earthquakes expected during the hour of the pole-shift? Can they store soil before the PS in poly-prop bags, wrapped in h/duty plastic and can they bury the bags underground? These are some of their most pressing questions. Chris– the thing is, they are simple people, but the salt of the earth– caring people. I am the only person who have told them about Nibiru and it took me almost two years to get them to trust that I am telling them the truth– So I want the information I give them, to be as accurate as possible– as even now, they say that your site speaks only about America and Europe etc –faraway countries … not about what is going to happen in South Africa. They believe you don’t want to talk about what is going to happen here, because it will be very bad, that’s why you don’t speak about South Africa or Africa at all– That because Africans are poor and don’t have the wonderful things that Americans have to survive Nibiru– they want to know, even if the news is not very good, at least, if you share what they should expect, they’d appreciate it very much, because then they’re in the position to do the best they can to survive. I have their request here with me and they know I support it– but know, that I am not a scientist and can only help them the best I can– so they want to hear out of your mouth, what you recommend, because implementing it, would save many lives. The local Sangoma has been of great help to me, but she also says this clever man from America must please speak about SA on his internet site– make a video, because then the people will believe and know what to do and they will then share it with other people further afield, and soon everyone will become aware and will start preparing for what the Nkulunkulu [God] will send from the sky and that at least they then have a chance to survive. Thank you for reading this appeal. Hello again Kznwatch. Thank you for your request for a safe locations video on South Africa. Please tell your contacts that the reason I started with North America and the U.K. is because of my high readership (Youtube channel viewers)was in those countries, by at least 10 X or more. Now I understand that South Africans have much less of an online presence, nevertheless, I have all along intended to do a video on Africa, this has not changed. I am currently assembling a video on Australia and New Zealand which will be out most likely before the end of the year. Next will be Brazil and India. The reason I am covering Brazil is because it’s eastern part will be well within the new Arctic Circle, thus un-survivable for many Brazilians. India’s situation is even far worse: the entire country will be sunk below the waves, India, as we’ve known it, will be no more. Now to respond to the comment that: “They believe you don’t want to talk about what is going to happen here, because it will be very bad,…” is not at all true. In fact, it’s quite the opposite. Let me tell you this: Last night I had a conversation over Facebook audio/visual with a woman wanting to know what will happen to the Island nation of Jamaica. The reason I asked her to call me, was because after having written her an email explaining the dire circumstances of the Caribbean Islands, she did not seem to be “getting the message”, since she sent me another email asking about how to survive there. So, I decided that I had to call her and tell her face-to-face that her beloved island was un-survivable, even with over 1500 foot high mountains: that her island with her family still living on it today, is destined to go under the waves. This was hard for me to do, but it needed to be done. For now I’ll answer the questions. The degree of sunshine will be very low and likely only a glow through low and plentiful clouds, so crops that require direct sunlight are to be avoided. I suggest storing the seed for when the Sun shines more brightly, which is likely to be in about 15 years. Meanwhile low light crops that need warmth, as SA will be warm, I would recommend beans chard, spinach, salad greens, beets, carrots and potatoes. Much rain (zt says drizzle), so well-drained land is needed. Tell your contacts that SA will be anything but cold. It will be positioned at about 20 degrees south latitude (current west) to 45 degrees (cooler) to the current east. Regarding the cement bunker: This is a very good (and common) idea to store what they want to grow in the After-Time. The ground in SA is very solid, so will vibrate but not open up in big cracks. So the bunker just needs to be able to withstand powerful ground waves, so steel reinforcing would be required, if they can’t get steel, then double the normal size of the walls. Build it with two exits/entrances Altough Bagging the soil and storing it by burying is a fantastic idea, it’s the first I’ve heard of that. One thing I would do is have a rope tied and visible above ground so that the bags are easier found after the pole-shift: Yes, that will work. Also, if possible, a covered semi-underground (half-half) greenhouse is another way to grow as well. Also, growing food water that is fertilized by fish tanks seems to be the latest good idea for containing food-growing for the after-time. Please tell your contacts that survivor migration in the year before the Pole-Shift (PS) (rich whites) will be occurring in parts of SA, these people are to be avoided at all costs. Also, migrants from SE Asia and India will be plentiful in the After-Time (AT) and also should be avoided at all costs. NO CONTACT with them, same with the whites. This is because of the Bubonic Plague that they will be carrying. Also, strict sexual contact between known individuals is to be observed, due to the well-known AIDS issue that Africa has, plus potentially carrying the other diseases that will be rampant as well. NO eating of wild animals, they will be carrying the Ebola (wet lands everywhere will stimulate the spread of this disease). I have had an independent Clairvoyant in the U.K. confirm this, it’s not just ZT. I hope this helps. I do have many requests for videos for areas around the world. As you can see, I’m doing the worst hit areas for now. If your group has more questions, please feel free to contact me again.